Interested in Natural History? Cannot satisfy your interest in sharks? 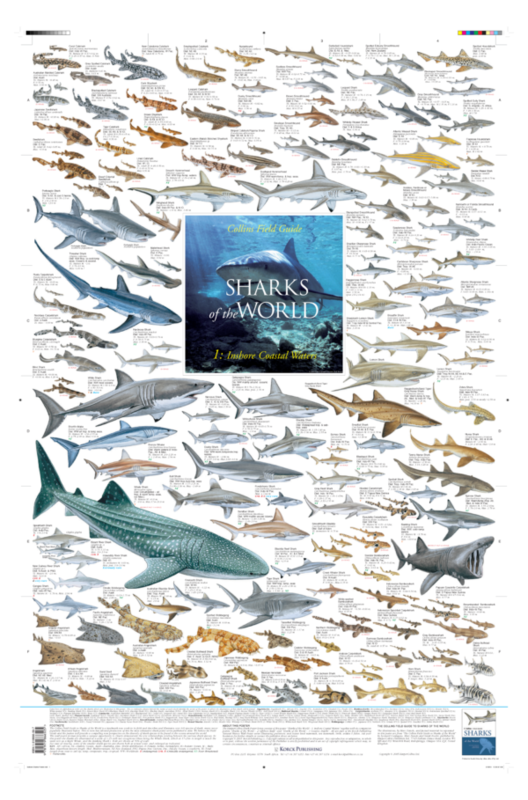 The three Korck Publishing shark poster subjects derived from The Collins Field Guide to Sharks of the World”, which describes and illustrates over 440 species of shark, “Sharks of the World – 1: Inshore Coastal Waters”. “Sharks of the World – 2: Offshore Reefs” and “Sharks of the World – 3: Oceanic Depths” will add enormously to your knowledge of the subject. The Korck Publishing “Sharks of the World – 1: Inshore Coastal Waters” wall poster subject shows 120 shark species, brilliantly illustrated by Marc Dando and including angelsharks, bamboosharks, bullhead sharks, carpetsharks, catsharks, hammerhead sharks, houndsharks, shysharks, smoothhounds, swellsharks, weasel sharks and wobbegongs. The three Sharks of the World posters are part of the 36 beautifully illustrated natural history posters produced by Korck Publishing, South Africa. The wall posters measure 900 mm x 594 mm (35.4 x 23.4 inches). The posters are double laminated (ie laminated both sides) for ultimate protection and will be shipped to you in a sturdy postal tube. Many of our customers throughout the world choose to frame or blockmount their posters such is the quality and impact of the posters themselves.